The equipment you’ll need — beyond normal extract brewing equipment — to make this beer. 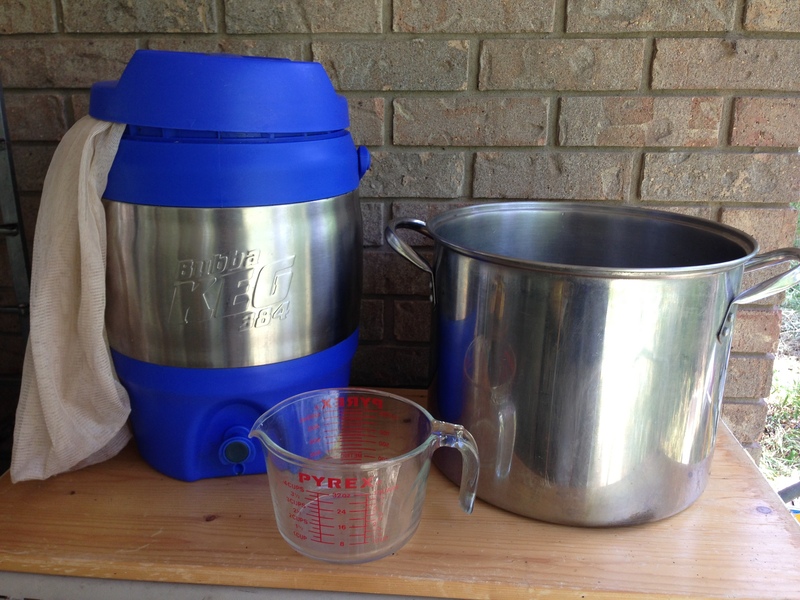 A 3-gallon (11-L) cooler, a large grain bag and a measuring cup. You will also need a brewpot capable of boiling 3.5 gallons (13 L) of wort. Here is an example recipe for a golden ale, made with malt extract. This is actually a moderately-sized partial mash. You will need a large grain bag and a 3-gallon (11-L) beverage cooler, the kind with spigot on the bottom to serve cold or hot liquids. You will also need to be able to boil 3.5 gallons (13 L) of wort. A crisp golden ale with a grainy and bready pale malt flavor. Hop bitterness and flavor are quite high for this type of beer, but not to the point of masking the malt character. The relatively high pitching rate and low fermentation temperatures yield a fairly clean fermentation, even though a Belgian yeast strain is used. Make yeast starter 2–3 days ahead of brewday. (Do not use Belgian yeast strain unless you make the specified size yeast starter.) Aerate starter wort well. On brewday, heat 7.1 qts. of brewing liquor to 163 °F. Place the crushed grains in a large steeping bag, put the bag in the 3-gallon cooler, stir in hot water and mash grains at 152 °F for 30 minutes. While grains are mashing, heat 2.5 gallons of sparge water to 190 °F. Recirculate the wort for 20 minutes, or until it clears significantly, whichever comes first. Do this by running off 2 cups of wort and pouring it gently back on top of the grain bed. After 30 seconds, repeat. Collect around 3.5 gallons of wort by first running off 2 cups of wort and pouring it into your brewpot. Then, gently add 2 cups of 190 °F sparge to top of grain bed. Wait about 30 seconds to 1 minute then repeat. Keep repeating until you collect the total wort volume. If you run out of sparge water, just drain the grain bed. Do not let grain bed temperature exceed 168 °F. (Cool your sparge water, if needed, by adding cool tap water.) Boil the wort hard for 60 minutes. If hot break does not appear as big, fluffy flakes after first 10 minutes of boil, add 0.25 tsp. each of calcium chloride and gypsum. Do not let boil volume dip below 3.0 gallons. Add boiling water to top up, if necessary. Add hops and Irish moss at times indicated. Stir in liquid malt extract in last 10 minutes of the boil. Dissolve the in wort to make it easier to stir in and avoid scorching. Chill wort to 65 °F and transfer to fermenter. Add cool water to make 5.0 gallons of wort. Aerate the wort thoroughly and pitch sediment from yeast starter. Ferment at 66 °F. (Ferment at 68 °F if using American ale yeast strain.) If feasible, after fermentation has been complete for 2–3 days, rack to secondary and move fermenter to a cool location (below fermentation temperature, but above freezing). Cold condition for 2 weeks. Bottle or keg and carbonate to 2.5 volumes of CO2. Option (for Clearer Beer): Add 1 vial of White Labs Clarity Ferm when yeast is pitched. Alternately, if you rack to secondary, dissolve 8 g of PVPP in roughly 2 fl. oz. 60 mL of hot water and gently stir into top layer of beer. Let settle overnight, then rack beer to keg or bottling bucket. Partial Mash Batch Sparging Option: Collect three worts total. Mash with 1.8 gallons (6.8 L), recirculate and collect the first wort (approximately 1.2 gallons/4.4 L). For each of the subsequent two sparges, add 1.2 gallons (4.4 L) of sparge water, recirculate and collect the wort. Sparge water should be heated to 180 °F (82 °C) for batch sparging. Grain bed temperature should not exceed 170 °F (77 °C) on final sparge. Make yeast starter 2–3 days ahead of brewday. (Do not use Belgian yeast strain unless you make the specified size yeast starter.) Aerate starter wort well. On brewday, heat 6.8 L of brewing liquor to 73 °C. Place the crushed grains in a large steeping bag, put the bag in the 11-L cooler, stir in hot water and mash grains at 67 °C for 30 minutes. While grains are mashing, heat 9.5 L of sparge water to 88 °F. Recirculate the wort for 20 minutes, or until it clears significantly, whichever comes first. Do this by running off 2 cups of wort and pouring it gently back on top of the grain bed. After 30 seconds, repeat. Collect around 13 L of wort by first running off 2 cups of wort and pouring it into your brewpot. Then, gently add 2 cups of 88 °C sparge to top of grain bed. Wait about 30 seconds to 1 minute then repeat. Keep repeating until you collect the total wort volume. If you run out of sparge water, just drain the grain bed. Do not let grain bed temperature exceed 76 °C. (Cool your sparge water, if needed, by adding cool tap water.) Boil the wort hard for 60 minutes. If hot break does not appear as big, fluffy flakes after first 10 minutes of boil, add 0.25 tsp. each of calcium chloride and gypsum. Do not let boil volume dip below 11 L. Add boiling water to top up, if necessary. Add hops and Irish moss at times indicated. Stir in liquid malt extract in last 10 minutes of the boil. Dissolve the in wort to make it easier to stir in and avoid scorching. Chill wort to 18 °C and transfer to fermenter. Add cool water to make 19 L of wort. Aerate the wort thoroughly and pitch sediment from yeast starter. Ferment at 19 °C. (Ferment at 20 °C if using American ale yeast strain.) If feasible, after fermentation has been complete for 2–3 days, rack to secondary and move fermenter to a cool location (below fermentation temperature, but above freezing). Cold condition for 2 weeks. Bottle or keg and carbonate to 2.5 volumes of CO2. Would cold conditioning for 2 weeks drop out yeast cells and lead to problems by Bottle carbonating ? !